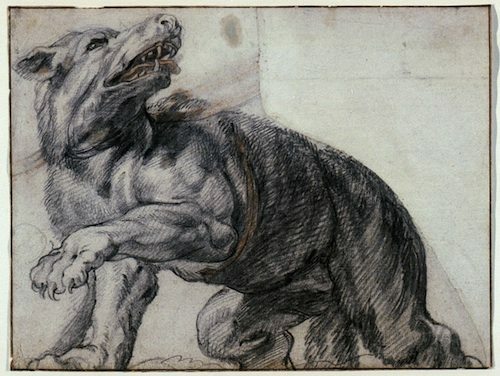 Frans Snyders, The Wolf (after Rubens’ Whitehall Ceiling), date unknown. Red and black chalk on laid paper, Art Gallery of Ontario. Erika Ritter’s fascination for our canine friends is no secret. 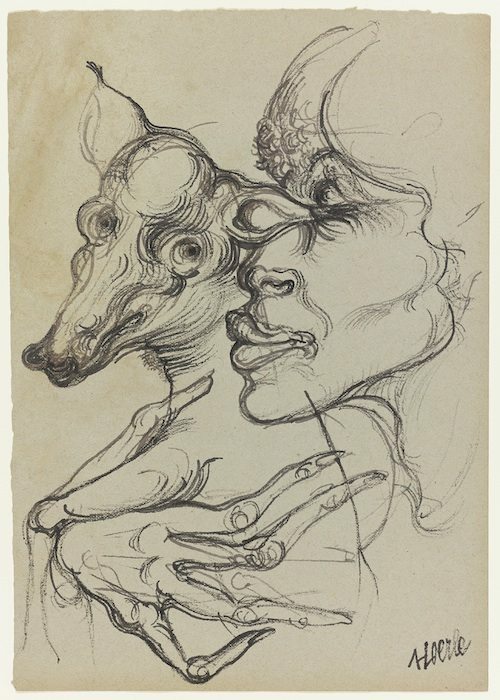 The author of five fiction and non-fiction titles, including the 2009 Writers’ Trust finalist The Dog by the Cradle, The Serpent Beneath: Some Paradoxes of Human-Animal Relationships (Key Porter Books), Ritter has recently been spending time at the Art Gallery of Ontario’s Marvin Gelber Print & Drawing Study Centre, studying and drawing works that feature dogs. 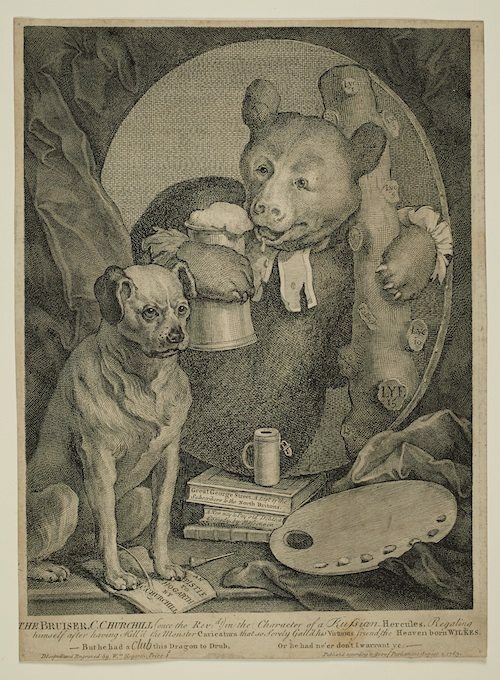 Tonight at 7 p.m., Ritter will give a talk at the AGO about her discoveries about dogs throughout art history. 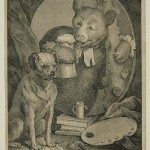 How did you start studying dogs and visual art? 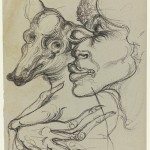 I’ve been looking at dogs in galleries for a few years now because of my interest in animals and art. 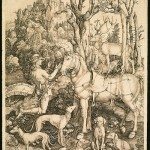 I started going to the centre on Wednesday afternoons – it’s an unusual feature of the AGO that there is a day of the week where a selection of the 20,000 prints and drawings in their collection is made available free to the public to look at. It’s one of these hidden Toronto gems. I’m working on a set of four novels, one of which has a character who is the “master of the dog,” as I call him: he’s a master artist but his subject matter is dogs. I was curious what the AGO had in the collection and what I could draw, especially from different periods. I like to draw – I’m not particularly good but I like to do it as a way of understanding artwork. What works will you be talking about in your lecture? I tried to restrict myself to art that I had actually worked with in the print and drawing gallery, and work that deals with dogs in various ways. 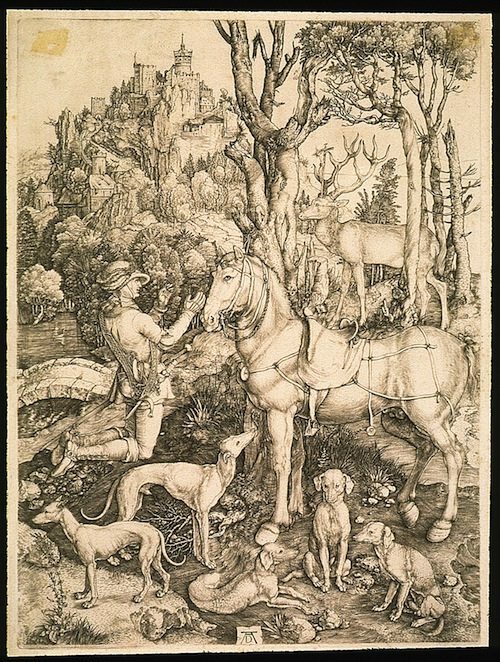 The oldest piece I’m looking at is a Dürer engraving from 1501, and the most recent is a pencil sketch that Greg Curnoe did in 1984 for a watercolour painting of his dog Rufus. There is one very preliminary pencil study that Alex Colville did for his famous painting “Woman with Terrier,” of a woman holding a wire-haired terrier. I’ll talk about a number of themes, such as the different ways we look at dogs, and the different ways they’re employed in pictures – either to mirror human activity or comment on human activity, or to be themselves the subjects of principal interest. Why dogs? They have such a complex relationship with humans, more than any other animal – including other domestic animals – more than cats, even. But as subjects of discourse either in literature or art, cats don’t appear as frequently as dogs because of the multifarious ways dogs relate to us, both on a level of quasi-equality and on a level of complete servitude. Our emotional relationship with dogs is so powerful that they make interesting characters. When I write fiction, I tend to personify them and write from their point of view. It’s something I find enjoyable. I look forward to taking their point of view even if it’s not really a dog’s point of view – the dog is a kind of humanoid commentator or experiencer. Also, they’re very attractive animals, with the variety of body, face, and fur. Can you talk about the four interconnected novels? It’s hard to describe how they’re connected, but certainly human-animal relationships, especially dogs, are part and parcel of these four novels. In a way, my interest in animals has developed from seeing them as comic characters I can use to be mouthpieces for certain thoughts or ideas. From there I became interested in animal-welfare issues and politics.